Why are there totem poles at the Louis L. Valentine Boys & Girls Club? 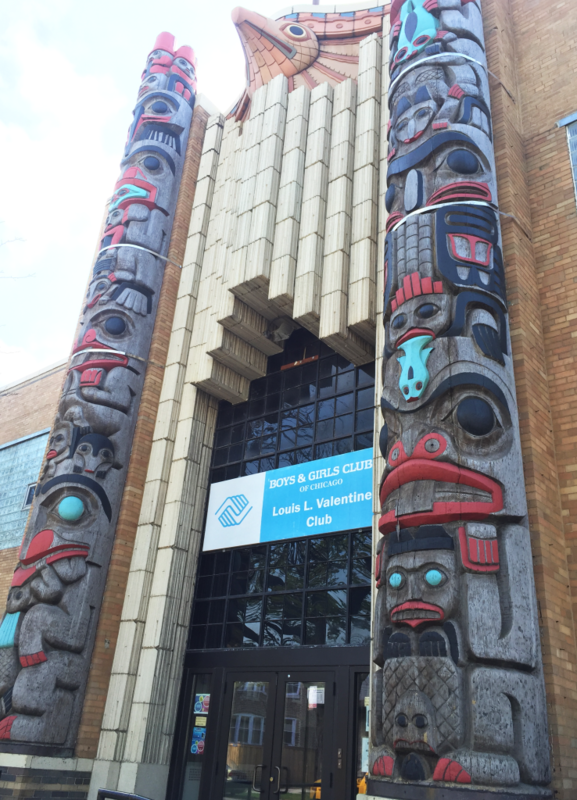 The doors to the Bridgeport branch of the Boys & Girls Club are flanked by a pair of totem poles. Made of red cedar and weighing five tons each, they have piqued the interest of passing Chicagoans often enough to appear in a book on Bridgeport and several articles in local papers. The exact height of the poles—forty-five feet or fifty feet, depending on whom you ask—is far from the only controversy surrounding them. Just inside the Club stands a model of the building’s entrance in a glass case. Complete with a small human figure for scale, the model includes intricately carved replicas of the totem poles, painted brown to match the wood of the originals, and the same shades of red, turquoise, and black as those outside. Next to the model, a number of old photographs and a framed letter are all that remain of a long history. “All we know about the poles is in this letter,” a secretary at the Club told me. Beside the letter, a set of photographs depicts a very different set of totem poles. Years ago, a charity group repainted them in bright primary colors. The new multicolored decoration made the carefully carved animals hard to discern and detracted from the poles’ overall power. In 2006, the Valentine Boys & Girls Club received a grant from the Illinois Department of Commerce and Economic Opportunity earmarked for capital improvements, including the restoration of the poles. A restoration crew worked from scaffolding, even in freezing temperatures and harsh weather conditions, laboring to scrape off every flake of colorful paint until the poles returned to their original design. When the job was finished, the model poles inside were repainted to match again. Though commissioned by the Club’s founder, furniture manufacturer Louis L. Valentine, the poles were only installed after his death. Valentine, who funded the Bridgeport Club location to provide a safe haven for children who would otherwise have nowhere to go but the streets, believed the totem poles would symbolically provide the same service, protecting and welcoming the children. Unfortunately, after funding the Club and the construction of the totem poles, Valentine could not afford to ship the poles to Chicago. After Valentine’s death, the poles were eventually shipped courtesy of the Great Northern Railroad. The totem poles have been at their current home at 3400 S. Emerald Avenue since 1941, a part of the Boys & Girls Club for decades longer than girls have been—up until 1990, the organization was called the Boys Clubs of America. Valentine hand-selected the trees that a group of commissioned Seattle woodcarvers crafted into mighty entrance décor. A 1941 Milwaukee Journal blurb, “Mighty Totem Poles Shipped 2,500 Miles,” says that the poles’ carver, Ernest Gebert, considered them to be “one of his artistic triumphs. They are fourty-three feet tall and took fourteen months to complete.” However, according to the framed letter kept on display by the Boys & Girls Club, the poles were carved by Fritz Hahn and Carl Gephart of the Architectural Decorating Company in Seattle. On one side of another point of confusion, the American Institute of Architects Guide states that Valentine’s poles are replicas of Alaskan Coastal Native American totem poles. A 1937 Chicago Tribune article, meanwhile, perhaps using older terminology to the same effect, claimed that the totem poles are replicas of the Field Museum’s “genuine specimens,” carved by Washington’s Alaskan Indians, measuring only forty feet. While it is unclear if the Club’s poles are actually replicas of any specific totem poles that can be attributed to one indigenous people, Valentine could certainly have been inspired by the Field Museum’s collections, considering his lifetime membership to the museum. The sole factor seemingly agreed upon is the fundamental idea behind the totem poles: they, like the Club itself, exist to protect the children. Despite the death of both founders during its development, the Louis L. Valentine Boys & Girls Club continues to successfully fulfill Valentine’s goal of guarding Bridgeport’s children. This message, succinctly symbolized by the guardian poles, has been central to the Club since the poles were first delivered free of charge in 1941. Today, these totem poles continue to stand guard over the children, with all their former—and current—splendor. I’m glad to hear this news for I worked at this club for almost 9 years. It was a pleasure and I remember my After School Valentine program family and still keep in touch since my departure in 2004. I am also a born and raised southside Bridgeport resident moving to the northside of Chicago when I got married. You can take the southsider out of the hood but you can’t take the southside out of the southsider.